Many patients with advanced Merkel cell carcinoma who received the immunotherapeutic pembrolizumab as first-line therapy in a phase II clinical trial had durable responses. Merkel cell carcinima is a rare, aggressive form of skin cancer. Responses to the drug were seen in those whose cancers were driven by a virus, as well as those whose cancers were induced by exposure to ultraviolet light, a type of radiation from the sun or other sources . The research was presented today, April 19, at the American Association of Cancer Research Annual Meeting 2016. This study was simultaneously published in The New England Journal of Medicine. “In this clinical trial, patients with metastatic Merkel cell carcinoma who received pembrolizumab had an objective response rate of 56 percent, which is similar to chemotherapy outcomes, but the duration of response to pembrolizumab appears to be significantly longer than that for chemotherapy,” said Paul Nghiem, affiliate investigator of the Clinical Research Division at Fred Hutchinson Cancer Research Center in Seattle and and UW professor of medicine, Division of Dermatology. In about 80 precent of cases of Merkel cell carcinoma, a virus called Merkel polyomavirus, abbreviated MCPyV, is the driving factor, Nghiem explained. The virus is often present on normal skin. About 2,000 new cases of this rare skin cancer are diagnosed in the United States each year. Merkel cell carcinoma is 35-fold less common than melanoma. On average,however, it is about three times more likely to kill a patient than melanoma. Response to chemotherapy is typically quite brief, and half of patients develop progressive disease within three months of starting treatment, Nghiem added. Nghiem and his colleagues enrolled 26 patients with advanced, metastatic Merkel cell carcinoma in this single-arm, open-label trial. None had received any prior, systematic therapy. Of them, 17 had MCPyV-positive disease. All patients received 2 mg/kg body weight of pembrolizumab every three weeks. Responses were assessed every nine to 12 weeks. At the time of data analysis, patients in the trial had received 4 to 49 weeks of therapy. The overall response rate was 63 percent in patients with virus-positive Merkel cell carcinoma and 44 percent in those with the virus-negative form induced by ultraviolet light. Four patients, three with virus-positive disease, had complete responses, and 10 patients, seven with virus-positive disease, had partial responses. Adverse events in this trial were similar to other trials of other PD-1 inhibitors -- drugs that block an immune system checkpoint called programmed cell death protein 1 and activate the body's defenses to attack tumors. Side effects were largely managed with steroid treatment and stopping the study drug, Nghiem added. The condition of two patients who developed severe drug-related toxicities improved by treating with corticosteroids and quiting pembrolizumab. “Importantly, both these patients have ongoing antitumor responses many months after discontinuation of pembrolizumab,” he noted. “We believe that the immune system is likely ‘seeing’ different targets in the virus-positive and virus-negative patients,” Nghiem said. He explained that the virus-positive tumors produce the viral proteins needed for the tumors to grow. These viral proteins may be readily detected by the immune system. In contrast, virus-negative Merkel cell carcinoma has extremely high numbers of mutations caused by sunlight. These mutations can change the normal cellular proteins so they no longer appear to be the body's own self. Certain of the immune system's T cell should be able to recognize and attack these tumors, but sometimes are restrained. Pembrolizumab acts by removing the “brakes” on tumor-specific immune cells, thereby allowing the T cells to kill the cancer cells. Currently there are no FDA-approved drugs for the treatment of Merkel cell carcinoma. "We are expanding this trial to recruit additional patients. We hope that these data will contribute to meaningful new therapeutic options becoming available for these patients,” Nghiem said. “It was initially challenging to partner with pharmaceutical companies because of the rarity of Merkel cell carcinoma," he added. " We are v thankful that the National Cancer Institute's Cancer Therapy Evaluation Program. 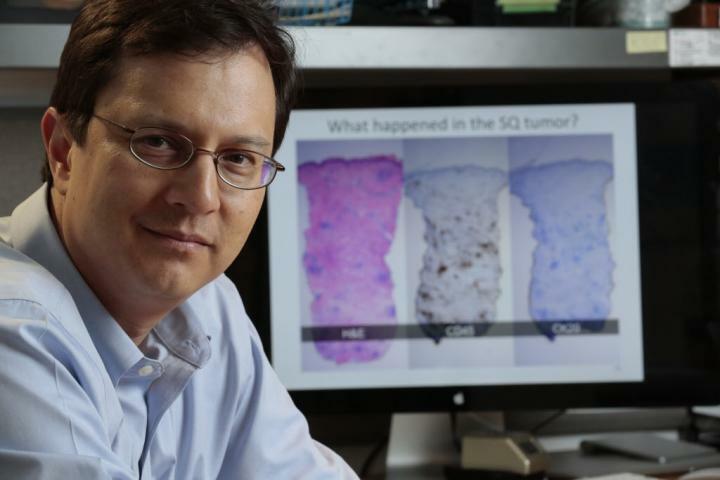 the Cancer Immunotherapy Trials Network, Merck, and multiple clinical sites came together to carry out this challenging study, which we believe is providing significant hope for Merkel cell carcinoma patients,” he added. Nghiem is a consultant for EMD Serono, Inc., and receives funding from Bristol-Myers Squibb to perform biomarker studies in Merkel cell cancer clinical trials.